It was not clear if any decision was taken to act against those responsible for killing police inspector Subodh Kumar Singh. 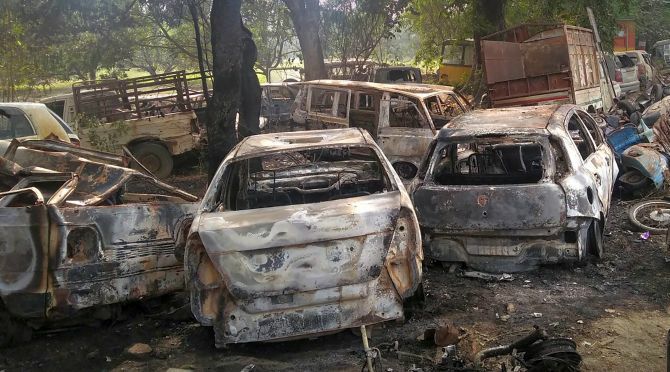 Amid a political furore over the killing of a police inspector and a man in Bulandshahr in a case of mob violence, Uttar Pradesh Chief Minister Ajay Singh Bisht on Tuesday night ordered a thorough probe. Directions were issued for strict action against those involved in the alleged cow slaughter, said to be the trigger for the brutal incident, a senior official said. A day after the tragic incident, Bisht held a meeting in Lucknow with the chief secretary, director general of police, principal secretary-home and additional director general of police-intelligence. The chief minister faces the flak from the Opposition parties for attending a laser show in Gorakhpur when the violence broke out in Bulandshahr on Monday. The Opposition has said such incidents are part of attempts to incite communal unrest in UP ahead of the 2019 general election. After the chief minister's meeting, Additional Chief Secretary, Information, Avinish Awasthi said, "The UP chief minister directed (officials) for a thorough probe in the incident. Instructions were also issued to take stringent action against people involved in cow slaughter." "The incident is part of a bigger conspiracy, and hence all those directly or indirectly related to cow slaughter should be arrested in a time-bound manner," Awasthi said. It was not clear whether any decision was taken to act against those responsible for killing police inspector Subodh Kumar Singh and 20-year-old bystander Sumit Kumar in the mob violence. Adityanath announced Rs 10 lakh financial assistance to Sumit's family members from the chief minister's relief fund, Awasthi said. The police inspector's family has alleged a police conspiracy in his death. Since March 19, 2017, Awasthi said all illegal slaughter houses had been closed and instructions were issued to all district magistrates and superintendents of police to ensure that such activities do not take place in any of the districts. The chief secretary and DGP have been instructed to ensure that this order is followed at all levels. Instructions were also issued that a campaign is run to identify those persons who are vitiating the atmosphere and stringent action is initiated against them, Awasthi said.